Hazell first appeared on the “Tonight Show with Johnny Carson” in 1989 and has been on with Jay Leno six times. While he’s an Omaha native, Hazell says he built the show around common denominators so that people from California, New York and any other state can relate. “I don’t mention my age in the show, I don’t actually say I grew up in Omaha,” Hazell says. “If I stay clear of that stuff, I find that people look at me, hear the content and think, I grew up near them, I’m from their neighborhood, I knew somebody they knew because they trick-or-treated the same route.” Hazell uses slides from his own childhood during the show to prove his points — including snapshots of a Colonel Sanders Halloween costume and a family vacation to the Four Corners. 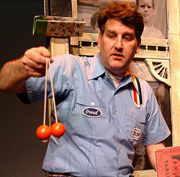 He also incorporates a host of authentic props in his act, including toys from decades past that might be considered health hazards today. The show is at the Civic Center of Greater Des Moines’ Temple Theater through Sunday. For details, visit www.civiccenter.org or www.pathazell.com.